Toddlers have been infatuated with the lovable train, Thomas, since he first made an appearance over 70 years ago. Thomas is popular as ever in 2019, with new movies still being released around once a year. As a result, the variety of Thomas the Tank Engine toys and merchandise found on shelves of toy stores is also growing at a rapid rate. That’s why we are here to help with this comprehensive guide to finding the best Thomas toys for your train-loving child. You’ll find helpful tips and reviews, to help you make an informed decision about which toy to go for. 2.0.1 What are the Different Types of Thomas the Train Toys? 2.0.2 What are the Benefits of Playing With Toy Trains? The first thing to think about is the type of toy your child enjoys playing with, or which they collect. Some kids love collecting wooden trains and tracks, so in this case, a wooden Thomas or one of his friends is a great choice. Other kids prefer ride on toys, and luckily there are Thomas options available here too! Age is another important factor. Whilst many Thomas toys are designed for toddlers, it’s important to check the manufacturer’s suggested age range. Some toys and playsets may contain small pieces which are not suitable for younger children, who may be at risk of choking on small parts. Here, we have reviewed 15 different types of Thomas the Tank Engine toys, ranging from wooden trains to huge playsets, so there is something to suit all tastes and budgets here. These motorized toy trains are compatible with all other TrackMaster sets, so they are perfect for kids who have already started collecting this range. The three engines included are Thomas, Yong Babo and Nia, and each comes with a cargo car which can be detached. They are battery-powered to enable them to move along the tracks, so in total for the three trains, six AA batteries are required. These Thomas and Friends trains are based on the Big World! Big Adventures! Movie, so they are perfect for kids who have watched and enjoyed the movie. The TrackMaster collection allows kids to customize their own railway track layout, and fill it with moving trains. They will love making their trains race one another around the tracks, and using their creativity to come up with different track designs. 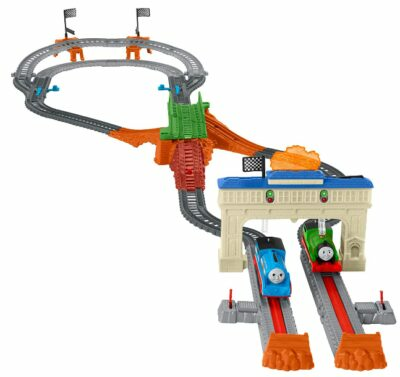 This Fisher Price Thomas & Friends set is an excellent choice for those who have a lot of space and really love Thomas! It comes with over 35 feet of track, which can be connected in a variety of ways to create different layouts. There are also a few figures included – Percy, Mini James, Harold and of course, Thomas. You’ll also find Tidmouth Shed and Brendam Docks, which are perfect for kids to make up fun adventures for Thomas and the other engines. The Thomas and Friends Super Station will provide hours of fun for any young Thomas fan. It can be built with ramps for the trains to climb up and down, and they can also move around the turntable outside Tidmouth Shed. Kids will also love to use the crane to move things around. This toy takes up a lot of space on the floor, so it’s not ideal if you’re short on space. However, the legs can be removed to help reduce the size for smaller spaces. 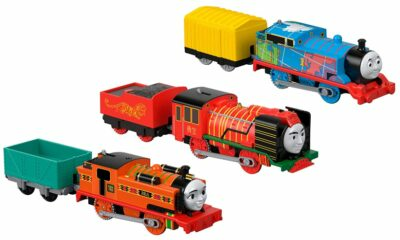 These Thomas & Friends Minis figures are ideal for kids who can’t decide which character they like best! There are 20 included in this pack, and there are over 80 to collect in total. It’s important to note, they are only designed to fit on the Mini playsets, as they are a smaller scale compared to the standard models. Each member of the Thomas and Friends train set has a connector at the front and the back in order to join different trains together. They will love unpacking this set to see which figures are included! There are classic models, animal-themed versions, construction-themed trains and even space versions of popular characters. Kids will have endless fun coming up with imaginative adventures for their trains to have on the Island of Sodor. This pop up tent is an amazing gift for a train-loving toddler. It is shaped as Thomas, and is 4 feet long, allowing more than one child to play inside. Kids will love the detailed features on the tent – it looks just like the real Thomas! More importantly, parents will love how easy the tent is to set up thanks to its pop-up design. There are two doors on the tent for easy entry and exit, and it’s also possible to connect play tunnels for even more fun. Children will love to use their tent for anything and everything – whether it’s playing, relaxing, reading or even having a snack, they will never want to come out from their new tent! This Thomas the Train ride is an excellent gift for toddlers and young children, between the ages of around 2 – 5 years old. There are non-slip steps which allow kids to easily climb up to board the train. There’s also a handle on the front of Thomas to hold on to for safety. The roller coaster track can be used both indoors, if space allows, and outdoors. The length of the track is 9 feet, which is perfect for young children. They will have such fun riding down it, and it’s good exercise when they have to push the train back up to the top to start again! There are wells at the top of the track for the wheels of the train to fit into, so your child can safely climb aboard without slipping down the track. Kids will have hours of fun playing with the Thomas the Train roller coaster! 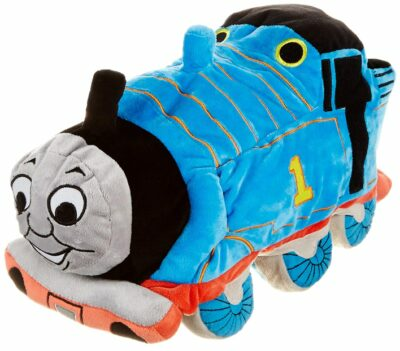 This plush Thomas is excellent for young fans who are looking for a new favorite toy to cuddle in bed. Measuring 15 inches and made from microfiber polyester material, the Thomas plush cushion is perfect for keeping kids comfy and cozy at night. The cushion can easily be spot cleaned, no matter how much your child uses it. It’s ideal for using in the car for comfort when traveling too, and is sure to keep kids comfy. If your child prefers other characters, James and Percy are also available. The motorized Edward is a great addition to any TrackMaster set, and it has recently been redesigned to offer faster speeds and overall better performance. Edward comes with his carriage, which can be detached from the train. Two AAA batteries are required to run the train, so be sure to stock up because your child will want to play with this all the time. This is another excellent Thomas the Train TrackMaster set, this time allowing Thomas and Percy to race one another. It’s based on The Great Race movie, so kids who have seen this movie are sure to love recreating their favorite moments with this set. The track is over 6 feet long, so make sure you have plenty of space on the floor to set this one out. Kids will love the details on this track and the trains – there are flags which wave as trains go past, and it’s also possible to start both trains racing at the same time for a fairer start. Both engines have been designed for racing and have a sleek and streamlined look – kids will love this! The Thomas the Train tracks will provide hours and hours of fun as kids build and rebuild them and race the engines – great fun with friends or alone. This beautiful model train by Lionel is an excellent collector’s piece, and is sure to make a young Thomas fan very happy indeed. It features amazing attention to detail, including moving eyes and real Thomas sounds just like on TV. There’s also a bell and a whistle, and three different faces so Thomas can have a different expression. The remote controlled train has an easy to use controller, with buttons to make the train go forwards and reverse, as well as sounding the bell or whistle. There are 32 track pieces, both curved and straight, and Annie and Clarabel the passenger cars are also included. This is a ready-to-play set, making it excellent for younger children. However, it is not compatible with other Lionel train sets as a result of this. This playset includes a Mini engine, and is compatible with the other engines in this series. The set is foldable, containing everything inside, making it an excellent choice for keeping kids entertained when out and about. Kids will love watching their engines ride down the ramp when the set is fully opened! 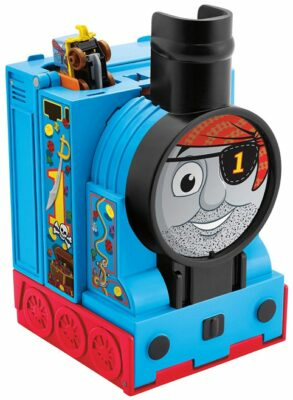 Other Mini Thomas engines can be hung from the sail of the ship, giving kids a handy place to store their spares. All in all, this is a great piece for kids who love the Minis range or are looking to start collecting them. Nia is a relatively new character who first made an appearance in Big World! Big Adventures! The movie. Kids quickly grew to love the fun-loving, bright and colourful African engine, and they are sure to love this die-cast model of her too. The metal model comes with plastic connection points at the front and rear, to allow other engines to be joined together. Kids will love the careful attention to detail on this model – she looks just as she does on TV. They will have hours of fun coming up with fun adventures for Thomas and his friend Nia, using the connectors to add different cargo trucks depending on their job for the day! 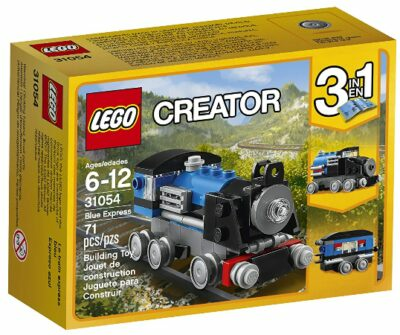 This LEGO Thomas set can be built into three different models – a carriage, a tank engine or a fast train. There are over 70 pieces, so kids over the age of around 6 years old will enjoy using this set. Other LEGO Creator sets are compatible with this set, so kids can built a whole range of fun vehicles! Kids can learn a lot from building this model – it is great for encouraging them to follow instructions. Once they are finished building, they can enjoy taking it apart and trying one of the other models, or they can play with the train along with their other toy trains. 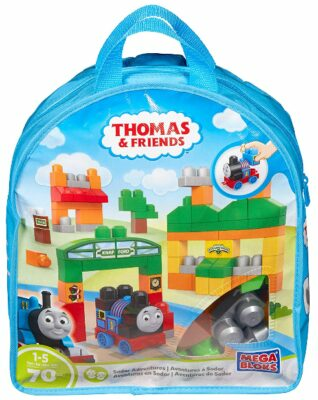 This Mega Bloks Thomas bag is suitable for children as young as 1 year old. It can continue to be enjoyed until the age of around 5, meaning this set sure provides excellent value for money. There are 70 pieces included, and the storage bag ensures nothing gets lost in between play times. Kids can use these blocks to build Maron station, Knapford Station and the steamworks of Sodor, and can also build a model of Thomas. Once all the pieces are built, kids can have hours of fun playing with them too – they will never get bored with this great set! The pieces are big and chunky, so kids can easily hold them and build with them, and they are not a choking hazard for younger kids. This is another good Mega Bloks set for kids who like Thomas and Friends. This kit comes with 5 pieces, making it easy to build even for younger children. 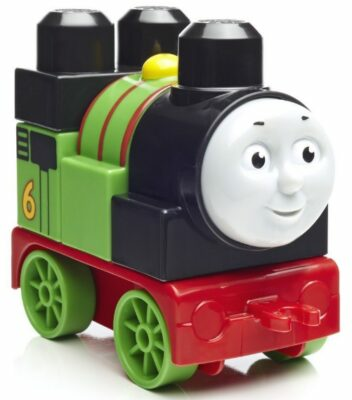 Percy features rolling wheels and a friendly face, so once he is assembled, kids will enjoy playing with him too. It is compatible with other Mega Bloks and buildable engines, which offers endless opportunities for building fun. Kids between the ages of 1 – 5 years old can enjoy using this set, and they will love to build their favorite engine. Other options include Diesel and Charlie, so no matter who your child likes best, you are sure to find them here! This wooden train can be used along with other Thomas and Friends wooden railway sets, and features magnets on the front and rear to connect other train carriages. The train is made from sustainable wood, so it’s perfect for parents who are concerned about the environment or are looking to cut down on the amount of plastic they are using. Children aged 2 years old and above will enjoy using this toy train. It will last for many years thanks to the high-quality materials used in its construction. There are endless possibilities for fun with a wooden train set, and kids will love having their favorite train as an addition to their collection! There are loads of great toys to choose from here, but the best has to be the Super Station. It has loads of pieces and fun features to keep kids entertained for hours. It’s the perfect gift for any Thomas super-fan – they will never get bored from playing with it! However, do ensure you have enough floor space to fully build the set before purchase, as it is one of the largest Thomas playsets around! What are the Different Types of Thomas the Train Toys? As you can see above, Thomas toys come in a variety of shapes and sizes. There are wooden trains which can be used in conjunction with track pieces and other train carriages. There are also Mega Bloks for kids who love to build, and huge playsets for the biggest Thomas fans. As well as toys, there are also various different items of Thomas merchandise. You can find pop-up tents, bicycles, scooters, and many more. There are even bedrooms sets available for those kids who are die-hard Thomas fans! What are the Benefits of Playing With Toy Trains? Kids can learn a lot from playing with toy trains, which is great because many children become slightly obsessed with trains at some point. Trains can help kids develop their imaginative skills – there are countless ways to build train tracks! They can also work on their problem solving ability in a similar way – which pieces are necessary to finish their circuit? Trains are also excellent for developing both fine and gross motor skills. By building tracks and connecting train carriages to one another, fine motor skills are used. When your child crawls around the floor to push their trains around, they are practicing gross motor skills. So, not only are trains loads of fun, they are also great for children’s development.